The waterfall of the Creux de l’enfer opposes its energetic and tempestuous vitality to dormant and stagnant water. NEPTUNE, with his irascible fury and diabolical trident, substantiates the tutelary figure, raising and scattering his spray of “floating images”. The impetuous water that flows at the foot of the art centre, this water that hammers it relentlessly, its magnetic flow of interaction, inspires Claire Tabouret with a primordial creative force. The water is a central thread in the pictorial theme and technique of her work. From the watery depths of her medium the colours rise in undulating surfaces, sometimes opaque and sometimes transparent. Yet the water calls us back to a seditious female nature, to smeared portraits and shifting identities. The project in Thiers begins with a temporary dwelling planted directly in front of a large vertical painting. Under its stretched cloth, this brightly coloured installation – a shelter or cabin made from an assembly of scraps of fabric – hosts a ghostly projection of a super 8 film. 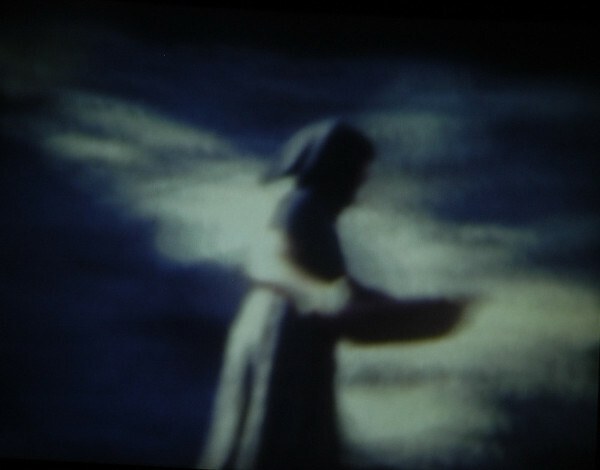 The transmental narration shows a woman draped in black, whose gestures in a spare landscape – between two waves – invoke the unfolding of an ageless water ritual. Though the paintings of Claire Tabouret are immediately charming, with their orderly composition and treatment, the opaline light that emerges from them pearls mezzotint on the canvas rather than raising a soprano to a cerulean sky. And if the subject intentionally scrapes against “the rigidity of social codes”, it is perhaps then to better stand out from an exterior tone that works so well everywhere. The exhibition once again deals with the themes of human wandering and the initiatory voyage but also the failure of society. The first is embodied by real or supposed mythical women : L’Indocile (2015) or the series L’Errante (2013) restoring to the figure of Isabelle Eberhadt, the exacting presence of a young poet with her rebellious, nomadic nature, the palette and gesture rendering her individuation in multiple genres and facets. With the series of paintings La Traversée, Le Passeur, Le Radeau and Le Radeau Blanc, Claire Tabouret raised, from 2011 onwards, the spectre of migratory tragedies whose geopolitical context brings us back to water and the oceans. We assimilate the mysterious (and numbered) series called Maison inondée, all painted in the same year, differently, as a sign of anchoring. Each one floats on a mirror of unstable water, doubling the image within ; a world divided between reality and reflection, between high and low, between an enlightened exteriority and the dizzying nature of its interiority. Claire Tobouret’s exhibition is spread over the two floors of the building and features around twenty paintings from private collections and from the Bugada & Cargnel gallery. It will also feature two new large paintings that have been created especially for the exhibition. Right from the ground floor the tone of the theme is given, with a video installation from 2004 : Un matin à venir, composed of a cabin made from pieces of fabric in which a super 8 film transferred to video is projected. claire TABOURET : This is why I imagined water as the central theme for my exhibition. In the ground floor room, I imagine a cabin made from pieces of fabric in which a film that I made in 2004 will be projected. This document is still very important to me and has not been shown since its creation. Filmed in Super 8, its grain and colours maintain a dialogue with my paintings. We can see an old woman walking along a stream, walking on stones, on the frontier between shadow and light. She washes the stone in an unchanging and mysterious ritual, with gestures of care, of erasure. The camera slips along a slow pan across a field of olive trees, with dark pieces of fabric hanging from the branches. This material – with its porous and absorbent qualities – has accompanied my work from the very beginning. The film runs for seven minutes and the waves of the sea punctuate the different chapters, with the last one ending on a funeral march that was composed and performed on the flute by Sylvain Perret. Then, hung on the large picture rail at the end, with heavy pulleys above it, I imagine a large vertical canvas borrowed from the new series that I’m working on. They include interwoven pieces of fabric glued to the canvases that link people together, in a similar fashion to the waves that engulf the stage. F.B. : Jim Harrison claimed that dreams of water were vital to him. A singular Russian artist, Leonid Tishkov in Moscow, assured me that when his mind was filled with doubt he would go to the waters of the Moskva “to confide in it, listen to it and speak to it”. And as a final example, Constant Permeke, a painter and personality just as instinctive, idled at the water’s edge during his youth as others studied on University benches. Yet fabric continues to reveal itself to be significant and symbolic in your approach, loaded with affect and meaning, clothing for lemures, floating matter. It is true that you like to restore the traces and shadows of a hybrid, real and imagined past. With this in mind, how will the exhibition then continue on the first floor of the art centre ? C.T. : Well, I would like to address the question of shifting identities on the first floor. To do this, I am going to use different series, like the canvases of Isabelle E. I was struck by a phrase from Yoko Tawada : “80% of the human face is made up of water, so it is not surprising that we wake up looking slightly different each morning”. Isabelle E. represents this idea perfectly, looking so different from one photograph to the next. Perhaps painting is better able to draw the outlines of these floating identities without necessarily fixing them in place. We will then walk alongside a wall that features flooded houses, like a shot panning across a sunken city, with each drawing being divided into two parts by the line that separates the landscape from its reflection. Though water may have ecological functions, I would also like to reveal its ever present threat. Questions of a more geopolitical nature then follow with the presentation of large paintings linked to migrant crossings by boat. This disjointed narrative thread will be embellished with new artworks scattered throughout the spaces, all linked to water in some fashion. This is the reason behind my choice of a title that echoes the untameable force of the torrent. 1) Isabelle EBERHARDT, Geneva, Switzerland 1877- Aïn Sefra, Algeria 1904 : Mother and Father of Russian origin, cultivated and eccentric, she turned her brief, free and intense life into a great anti-conformist, spiritual and nomadic adventure. With the clothes and hairstyle of a boy, she travelled all over southern Algeria, adopting the Muslim religion like Arthur Rimbaud and living the life of a Bedouin. A character that the author of La Ville noire, Geoges Sand, would have appreciated. She met General Lyautey who noted her perspicacity with regard to Africa and her incomparable individual independence. She died at home when she was 27 – in the middle of the desert – in the overflowing waters of a wadi. Her short stories and tales of travel provide sensitive information about a little documented period and sumptuous but little known spaces. On her gravestone in Aïn Sefra (Algeria), is written : Isabelle Eberhardt, writer, Mahmoud Saadi, mystical adventurer of the Sahara. A catalogue will be published after the exhibition with the participation of the Le Parvis centre for contemporary art, the Scène nationale Tarbes Pyrénées, and the Galerie Bugada & Cargnel who represent Claire Tabouret in Paris. Le Creux de l’enfer would like to thank Frédéric Bugada, Claudia Cargnel et Marine Moulin, and also Patricia Mattus, assistant to Claire Tabouret. We would also like to extend our warmest thanks to the private collections who have lent artworks for the exhibition for their kind cooperation.